I’m a sucker for early natural philosophers, so I admit the pre-publication description of The Mechanical, Ian Tregillis’ new novel, pretty much had me at, “Soon after the Dutch scientist and clockmaker Christiaan Huygens…” The rest of the blurb, about a “mechanical army” of “Clakkers” allowing the Netherlands to become the world’s sole superpower, the French trying to make a last stand in North America, and an “audacious Clakker, Jax” making “a bid for freedom”? Icing on the cake. And a sweet, rich cake it is, too. The Mechanical begins two centuries after Huygens’ discoveries paved the way for the Netherlands’ creation of the Clakkers — clockwork servitors/soldiers. The Brasswork Throne dominates the world, and has just concluded an uneasy peace with the French, who have fled their own country to New France in North America, basing their capital-in-exile in Marseilles-in-the-West (Montreal). Also resistant is the Papacy, as the Catholic Church believes the Clakkers to be thinking creatures and thus their slavery to be an abomination. The torment of an unfulfilled geas speared Jax’s mind, his joints, his every bearing and pinion. He doubled over. He took an involuntary step toward the Stadtholder’s Gate … Another step. Another. Granite crumbled to sand beneath his grip on the Little Tower’s façade … He needed to see. As the blurb says, and as any reader will immediately guess, it is not long before Jax, through a series of events, turns rogue himself, and that event will catapult him into deadly danger fighting for his newly free life in North America. Another POV comes via the sole remaining member of that Papist spy ring, Father Luuk Visser, who has been masquerading as a pastor. We meet him as he is about to commit suicide so as to keep his secrets safe, but much to his surprise, it seems he has not been betrayed. His life too will be turned wholly upside down, though to give any more details would ruin some major plot points. Finally, the last POV gives the French perspective through Berenice de Mornay-Perigord, a vicomtesse who holds the spymaster title of Talleyrand and reports directly to the king in exile in Marseilles-in-the-West. The destruction of her cell in The Hague has damaged her standing, though she makes one final push to convince the king to take the risk of renewed war by breaking one of the treaty’s rules and bringing into the fortress an immobilized Clakker soldier that the Dutch are unaware of, thanks to its placement in the fort’s defenses. Her ultimate goal is to learn not just how to better defend against the Clakkers, the unstoppable force that has pressed the French into this sliver of land, but how to turn them to the service of the French. All three are fully formed, engaging characters, and each allows Tregillis to bring something different to the table. Visser offers the opportunity to dig into some heavy philosophical/existential discussion of free will, the soul, and so forth, both through interior monologue and through an almost formal debate with one of the guild members who create the Clakkers. Jax is the emotional core of the novel, the character the reader can’t help but empathize with in his desperate yearning to be his own individual. Berenice, meanwhile, adds a nice bit of grey area. We root for her thanks to her resistance to the Dutch slavemasters, but the lengths to which she is willing to go in order to achieve her goals, and her discomfiting attitude toward the Clakkers (not to mention her seeming willingness to keep them slaves so long as they are “her” slaves) make us cringe. While Jax is, as mentioned, the emotional core, that isn’t to say the other characters do not have their moving moments. Far from it (Though it is not a stretch to say that the most poignant scene involves none of the main characters at all, but an airship. Yes, I said an airship). And each character has at least one extended scene of intense action. All of them also make some pretty big mistakes, often leading to irrecoverable consequences and harm to if not themselves, those around them. For instance, thanks to that opening execution scene, we’re served early notice that Berenice is not some omniscient uber-competent spider at the center of a web of spies. She makes mistakes and those mistakes can lead to people dying. The strong characters, intriguing world, precise language — there are some lovely details throughout — , and wholly engaging plot (I’d go further with Jax’s storyline and call his compelling) combine to create a novel that is easy to recommend. That isn’t to say I don’t have some minor quibbles though. The world building is interestingly sufficient, but that’s about it, although I assume since The Mechanical is labeled “Book One” that we’ll have more details filled in as we go. Father Vissar’s character disappears a bit too long perhaps at times. And the climactic scene at the end smacked a bit too much of TV/movie plotting in terms of everything having to go just right (though Tregillis redeems himself by not having things go just right). And some might complain that the ending resolves too little, though again, we are just at the start of the story here, so that one doesn’t bother me much. Those are, like I said, quibbles though. 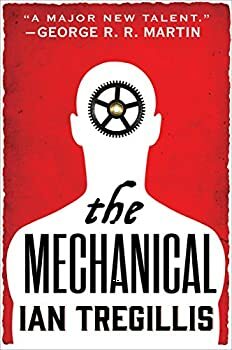 The Mechanical is a strong opening novel to the series, and is such as much for its thoughtfulness as for its basic storytelling elements of character and plot. One of my favorite aspects is the depth with which Tregillis has his characters discuss the big questions of free will and existence and consciousness. And also how he presents these big questions as inevitably roiling the world once the Clakkers are invented. Too often in science fiction we get societies with some brand new invention or alternate histories with steampunk abilities or clockwork men etc., and they’re fundamentally the same old society, just with new devices. But those sorts of changes don’t just affect the surface of a society; they would affect its core beliefs as well. You can’t create mechanical beings and not have people wonder then about, well, being. And wondering about being, as we’ve seen in history, leads to great turmoil, to violence, to out and out war, to the overturning of some institutions and the rise of others. It was a pleasure to read a book that acknowledges this. And thus the high recommendation. Published March 10, 2015. The Clakker: a mechanical man, endowed with great strength and boundless stamina — but beholden to the wishes of its human masters. Soon after the Dutch scientist and clockmaker Christiaan Huygens invented the very first Clakker in the 17th Century, the Netherlands built a whole mechanical army. It wasn’t long before a legion of clockwork fusiliers marched on Westminster, and the Netherlands became the world’s sole superpower. Three centuries later, it still is. Only the French still fiercely defend their belief in universal human rights for all men — flesh and brass alike. After decades of warfare, the Dutch and French have reached a tenuous cease-fire in a conflict that has ravaged North America. But one audacious Clakker, Jax, can no longer bear the bonds of his slavery. He will make a bid for freedom, and the consequences of his escape will shake the very foundations of the Brasswork Throne. They sound like mechanical golems. This sounds like a wonderful book. Thanks, Bill.